A Treasury bill (or T-Bill) is a short-term government debt security, which yields no interest. Rather, it is issued at a discount on the redemption price. Basically, the Federal Government issues treasury bills at discounted prices for maturity periods between 91 and 364 days. At the end the selected maturity period, the government buys the bills back at full price. For example, let’s say you buy a 182-day ₦200,000 treasury bill at a discounted rate of ₦180,000. The Federal Government of Nigeria writes an IOU for ₦200,000 and agrees to pay back in 182 days. You don’t get any monthly interest payments, rather you make your money back when the bond is purchased back from you at full price. 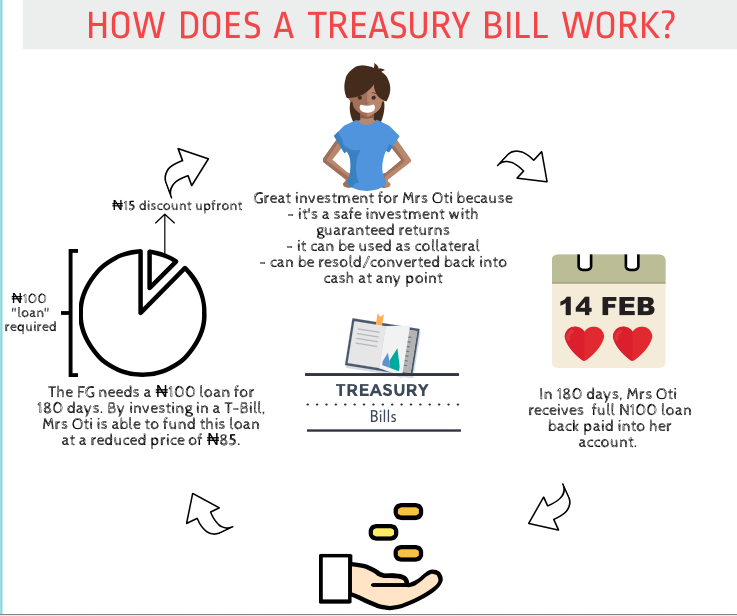 In this case the T-Bill pays 11% interest rate (₦20,000/₦180,000 = 11%) over the 182-day period. You will not get any e-mail alerts of notifications until the end of your tenure, so don’t expect any – just be patient. You only get a debit notification when the money is taken out of your account, and a credit notification when the money is returned at the end of the tenure. If you want proof of your investment, it is best to request this from your bank once the money has left your account. You will need to ask them for a T-bill certificate after payment has been made. Where can I purchase T-Bills? T-Bills are sold via commercial banks and official agents such as merchant banks, and sales are open to individuals and corporate investors. Is there a minimum purchase amount for T-Bills? It depends on the bank. Some banks offer a minimum of ₦50,000, while some offer a minimum of ₦500,000. There are 3 tenures available: 91 days, 182 days or 364 days. How can I buy T-Bills? First, you will need to complete an application form issued by your bank or an approved discount house such as Kakawa Discount House Ltd. You will need to submit your application early, as most banks are required to submit applications received by the Wednesday before the dates announced by CBN – which you can get on the CBN website or in the dailies. Alternatively, your bank might be able to provide you with notifications ahead of time. When completing the application form, you will be requested for a discount rate – which is the percentage by which the face value of the bill is discounted by. Current rates in Nigeria are around the 12% – 14% mark. You can request for this rate to either be set by your bank, or specified by you (under the “stop rate” section of the application form). If you do however choose to specify a rate which is significantly higher than what the CBN is prepared to offer, your bid will fail. Various banks will offer you various stop rates/discount rates, depending on how much you want to invest and how long you want to invest it for so it is a good idea to shop around and not go with the first offer you receive. Do your research and select a bank carefully as people have reported banks offering as low as a 2.4% discount rate. As at October 2015, unverified informal accounts suggest that Firstbank seems to have the best bid rate for a 91 day tenure at 9.5%. It is very easy to calculate the returns on your investment, and how this is paid. If for example you purchase T-Bills worth ₦100,000 at a 10% discount rate, CBN only debits your account of ₦90,000. At the end of the maturity period, you are paid your face value sum of ₦100,000. It is possible to sell your T-Bills before it maturity using the OTC market. Because this is governed by the forces of demand and supply, you might make a loss if you choose to sell them before their maturity date. 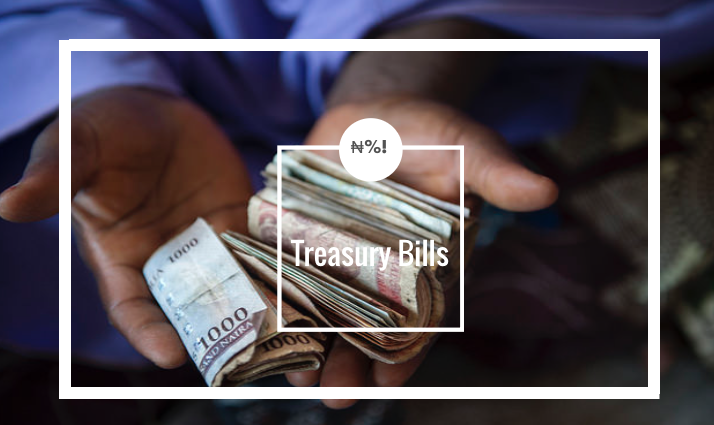 As T-Bills are based full faith of the Federal Government of Nigeria, they are considered one of the most secure investments to make. They can also be used as collateral, and are accepted by all banks. You don’t get interest as you would get with a bank. You just get the full value of the bill you purchased at a discounted price. How do I know the T bills are going on sale? There are fixed terms after which you will be paid – 91 days, 182 days and 364 days. You don’t get paid monthly, you get paid at the end of the term, depending on which term you pick. Someone explained Treasury Bill with this example, which ia different from your anaysis here sir, kindly throw more light sir. Are there any terms and conditions attached to T.Bills e.g withholding tax etc? If there are, what exactly are they? There is no tax on the returns as it is a government security. That would be like you lending the government money and they forcefully take more than you lent them. I must thank you for this great work your doing #kudos to you. Will like to share with you platforms where one can invest and get steady stream of income while their Capital is well preserved. will email more on it. My name is Kingsley a Financial Advisor as well. It does appeal to some people. Inform me on any update please about the current news on Treasury bills. So banks can fix their rates if you are buying through them on the secondary market – which is like the secondhand market for T-bills. This is quite interesting. Must it be in my existing bank or I can visit any bank for Tbills only? Is there a limit to how much one can invest with in T-Bills? Good day Mr Pepe, thanks for this platform. I invested in T-bills sometimes in October last year via my bank (GTB). I want to find out, am I supposed to get any certificate, or receipt, apart from the debit notification on my account, to show my investment? It is best to ask your bank for a certificate after the money has been paid. This is what you can then use to prove your investment. hellow mr pepe.please sir,I like to invest in treasury bills via gtbank,please how what are the steps to be taken. Good day MrPepe, thanks for this good work but i want to know if no document or certificate is issued in T bills, how then can i use it as collateral for loan if there is nothing to show for the investment made with the Government? Hi Michael, This is a good question. You will need to ask your bank for a certificate or proof of the investment. Thank you for taking your time to educate the readers about this, Joe. @ Ejeh Michael. once your Tbill is successful, you will get an email notification of your successful Tbill bid details. It is required of you to ask or request for the certificate/statement from your bank. It is the detailed statement of your successful Tbill that is called Tbill certificate. But i was denied a loan with it at fidelity bank because i was not a salary earner but a business man. So don’t expect to get a loan with Tbill certificate. Please I want to know. If I’m to apply for treasury bill, how should I fix the rate. Should I depend on my bank to do that for me or should I fix the rate based on the previous rates. Again. It is possible to apply for treasury bill of 91 days with the same bank for four times a year. I need immediate response. thanks for the good work. I will like to invest on t-bill.I to understand it more before I take the decision. Hi Romanus, I think the post is straightforward. Please feel free to ask any questions you have and i’ll try my best to answer. What is the minimum amount someone can invest? Hello Gbenga. You would have to find that out from your bank. Speak with your account manager. Thanks for the update. Pls I want to ask, how can one reinvest after the maturity period? Say I invest 100,000 in tbills for 91days, but don’t want my capita return. Hi Ethan, I invest in TBills but fill out a form all the time. Do you know if any bank or if the CBN has an online platform for TB investments. This will make the process more efficient. Hi Adams, have you got any specific questions not addressed in the post? Please are treasury bill interest paid at time of purchase or at the maturity of the bill. Is there an option of interest payment at maturity of the bill? Please in the form I filled in the bank, there is an option for invest interest which I did, I want to know how much I will get in return, I invested 170,000 naria for 91days at the rate of 13.2%. How do I calcalute the interest? Please Mr pepe, what’s the Tbill rate of Zenith Bank a week ago? Thanks for the good work. Please I will like to know if fore instance CBN fails to pay you on the due day after your tenor; what or can someone takes legal actions against such laxity? Hello pls when are we expecting this month’s rate to be announced.? And what’s the interest amount of 1m going to be @13%, howmuch will i get on the 1m for the 13% at 90days window..? What is the difference between bonds and treasury bills? This is really interesting but Mr pepe isn’t any longer here for the needed responses. Pls come back, I know that some of the questions are repeated and boring but there are still a few twists which need straightening, pls don’t kill the excitement,nigerians need to raise money, hook or crook. Thanks a plenty for this forum. Hello, pls I need advice on which bank currently offers the best %age for T bills now. How much can I get for an investment of 6M for a 6month window considering what rate is available? Hope pepe is still here to handle issues as I see that no entries has been made here since Dec 8th? Good work you’ve done here, keep it going! Thanks for the heads up, Jide! Pls I will like to know the difference between treasury bill and treasury certificate. I’m afraid you will need to call the banks individually to check their rates. I would recommend calling on a Sunday, as you won’t wait long in the queue. Pls more advice, i want to invest 100,000 in this platform. What will be my gain after 90 days. I feel elated being here. Thanks to Sir Ethan. Hi, I invested in a treasury bill. It lists the Face Value as N250,000.00 at a Discount Value of N231,806.85 and a rate of 11.4% maturing in six months. I’ve done every calculation imaginable but I still don’t get the 11.4%. Please, what am I missing? Hi, I do believe this is an excellent blog. I stumbled upon it on Yahoo , i will come back once again. Money and freedom is the best way to change, may you be rich and help other people.”;you can visit my link to see how the big boys and gals make easy cash without selling anything, using scrapebox combined with payper view sites. I enjoy you because of all of the work on this web site. Kim loves doing research and it’s easy to see why. We learn all about the compelling manner you create vital techniques by means of your website and foster response from others on that issue so our own child is actually learning a whole lot. Take advantage of the remaining portion of the new year. You are doing a superb job. How do I buy treasury bill from primary market instead of secondary market from the bank? Nice job, please what will be my advantage if I should leave my money for 91 days, 182 days and 365 days respectively? The percentages rates and Interest. Thank you.